CUTLINE: From left: JM Assistant Principal Geno Polsinelli, Colton Asbury and Worthy Warden of the Knights of Columbus Moundsville Council 1907 Lewis Richmond. 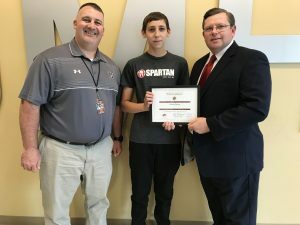 The Knights of Columbus John Marshall Freshman Student of the Month for April is Colton Asbury. He is on the cross country, swim and track teams. He’s also enrolled in honor classes. John Marshall Assistant Principal Geno Polsinelli believes Colton really deserves this award. “He defies the odds in a lot of different ways not only academically, but also socially. He’s one of the biggest leaders in the freshman class. He comes with high regard from his teachers,” Polsinelli added.